Rhodochrosite is one of my favorite stones. It is one of the best heart healing stones, stimulates warm feeling of love, allowing healing for the emotional and physical bodies. Brings you a feeling of joy, positive attitude towards life. Stimulates circulation and blood pressure, kidneys and reproductive organs, helps migraines. One of the stones that help cancer patients heal. Healer of deep grief and sorrow, and abuse issues. Help heal the physical heart, opens heart and solar plexus chakras. Please note, each stone is created differently from Mother Earth, color and texture of pattern may vary, and may not be the one pictured. 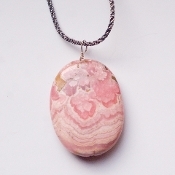 AA Rhodochrosite from Argentina on silver-colored satin cord, 24 inches. Limited supply.